The holidays are a time of celebration and travel, and as a consequence, the roads fill with tired or inebriated drivers transporting their families. This year, we saw and participated in new government initiatives to make roads safer during the dangerous holiday season. From Thailand to China to Dubai, governments around the world put their focus on enforcing the laws that keep roads safe. We were happy to be a part of these initiatives, and are optimistic that the momentum behind this issue will continue throughout 2014. 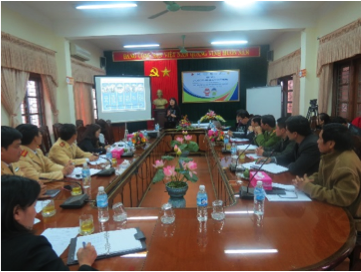 On December 29th AIP Foundation organized a training course for policy makers in Quang Binh to enhance implementation and enforcement of the child helmet law. Representatives from the Department of Education and Training, Traffic Safety Committee, and Dong Hoi traffic police attended the course which was supported by the Global Road Safety Partnership (GRSP) with financial assistance from the Bloomberg Philanthropies. Ms. Nguyen Dieu Nuong, National Program Director of AIP Foundation, presented about the status of and challenges to child helmet use in Vietnam. The information presented included current regulations of child helmet use and quality, theories of behavior change communications, and trends in media coverage of road safety. Participants practiced designing, implementing, and evaluating road safety communications campaigns, and registered for forums in which they will be able to collaborate on innovations in child helmet enforcement. 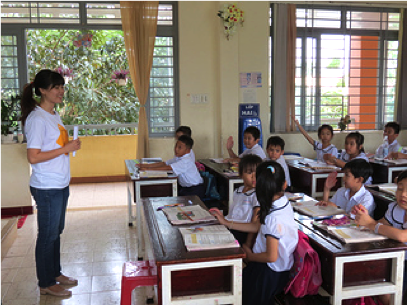 On November 29th and 30th and December 5th, the Asia Injury Prevention (AIP) Foundation organized end of year review workshops for Johnson & Johnson-sponsored Helmets for Kids project schools in Quang Binh, Ha Tinh, and Dong Nai. At 32 project schools, 10,540 helmets were donated and in turn, helmet wearing rates increased from 22 to 95 percent on average. 36 crash cases have been collected since the beginning of the 2013-2014 school year. In most cases, the student or teacher involved in a road crash suffered less severe injuries because they were wearing the helmet they received as a donation. The schools not only cooperated with Johnson & Johnson and AIP Foundation to conduct the helmet distribution, training, and extra-curricular activities typical of the Helmets for Kids program, they also collaborated with the local government, local unions, and the police department to organize traffic safety knowledge contests, performances, and discussions for students. 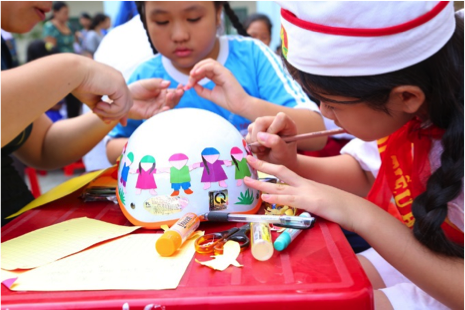 In 2014, these Helmets for Kids activities will continue at all project schools, and expand to reach more students. 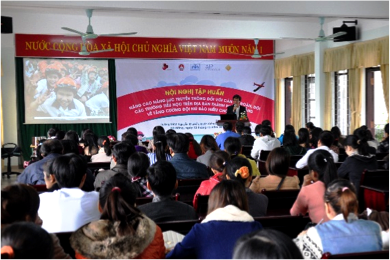 On December 12th, the Da Nang Department of Education and Training and AIP Foundation organized a road safety workshop for 103 teachers at Nguyen Khuyen High School in the Cam Le District of Da Nang. The workshop included a seminar on child helmet use that covered national child helmet wearing rates, challenges to helmet wearing, and proven solutions and measures to increase child helmet use. The teachers also participated in discussions on educational activities that have been proven to inspire behavior change among primary school students and their parents. The training course was organized as part of the three-year "Children also need a helmet" public awareness campaign's activities in Da Nang. On December 19th and 20th, AIP Foundation spread awareness about road safety at a two-day health and safety event at RMIT University in Ho Chi Minh City. The event included the launch of a campus-wide road safety plan for 2014, including the foundation of a student road safety action group. Representatives from AIP Foundation and Protec staffed road safety booths that provided students with information about proper helmet use, how to identify quality helmets, and how to practice safe road behaviors. 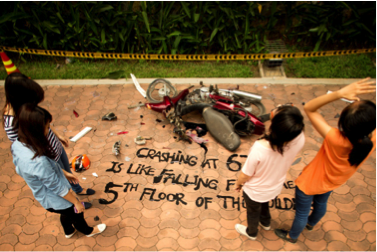 In order to warn students about the danger of speeding, Young & Rubicam and AIP Foundation collaborated on a display demonstrating that the impact of crashing when traveling at 67 kilometers per hour is equivalent to the impact of falling from the 5th floor of a building. On December 14th and 22nd, nearly 4,500 parents and students from the Binh Tan and Tan Phu districts of Ho Chi Minh City joined "Kids love helmets" family days organized by the Ho Chi Minh City Department of Education and Training, the Traffic Safety Committee, and the Asia Injury Prevention (AIP) Foundation. Family days are being organized in Ho Chi Minh City, Hanoi, and Da Nang as part of the activities of the "Children also need a helmet" public awareness campaign. "Kids love helmets" family days give students and parents the chance to have fun while learning about traffic safety and the importance of helmets through activities like slow cycling, puzzles, helmet decorating, and flash mob dances. In addition to the family day, parents and students of Tan Phu district received hand fans and helmet coupons, and will be entered in lucky draws and invited to attend information sessions conducted by traffic police on the importance of helmet use for children. 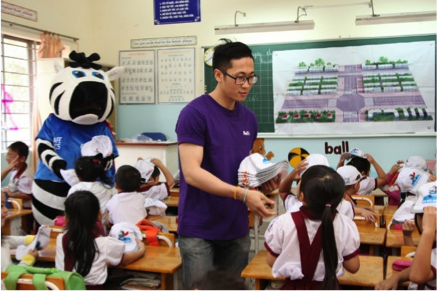 On December 23, FedEx, Safe Kids Vietnam, the Ho Chi Minh City Department of Education and Training, and Traffic Safety Committee launched the 'Walk with FedEx Tour' to bring pedestrian safety education and equipment to 13,019 students at 14 primary schools in Ho Chi Minh City. From December 2013 to April 2014, Walk with FedEx will educate students about safe pedestrian behaviors through in-class sessions and games. Each participating school will designate one 'Safety Day' for the Walk with FedEx activities. FedEx employee volunteers and school coordinators will facilitate the trainings, distribute pedestrian safety equipment, and provide guidance during mobile traffic simulations that will allow the students to practice pedestrian safety skills in a safe environment. Walk with FedEx is an initiative under Walk This Way (WTW), the road safety advocacy program launched by FedEx and AIP Foundation as Safe Kids Vietnam in 2009 in Vietnam. Since then, WTW has reached over 45,516 students from 70 primary and secondary schools in Ho Chi Minh and Hanoi, installed a 1,700 square meter traffic safety park in Dong Nai Province for primary school students, and donated 3,472 helmets, 6,852 reflective jackets, and 45,516 pedestrian safety books to pupils. News update: Traffic Death Toll Rising on Cambodian Roads According to the World Health Organization, nearly 2,000 people died in traffic accidents in Cambodia in 2012; a doubling of the death toll over the last seven years. Cambodia's road deaths account for nine times the number of deaths from malaria, dengue fever, HIV and AIDS, and landmines put together. Cambodian driver behavior is a major factor in traffic deaths; drunk driving and speeding are particularly of concern, along with failure to wear helmets or buckle seat belts. The helmet wearing rate at Wat Preah Put Primary School in Phnom Penh has risen rapidly from zero to over 78 percent since AIP Foundation and Manulife Cambodia Plc. donated more than 640 helmets to students, teachers, and parents through Helmets for Families in October 2013. To maintain this increase, AIP Foundation has followed-up with the school to engage parents in road safety activities. On December 13th, parents joined a road safety training course focused on the benefits of correct helmet use and the importance of their roles in modeling good behaviors and ensuring that their children wear their helmets every day. 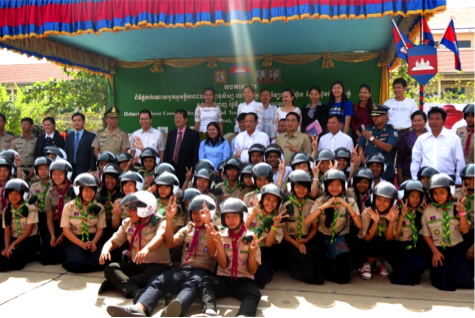 On December 24th and 30th, Chevron and AIP Foundation hosted helmet kick-off ceremonies at two high schools in Phnom Penh, Cambodia as part of the Helmets for Youth program. A total of 900 helmets were donated to students and teachers at the events and 4,000 students received vital road safety education. Hun Sen Bunrany Wat Phnom High School hosted the ceremony on December 24th that was chaired by a representative of the Ministry of Education, Youth, and Sports. The kick-off ceremony at Boeung Trabaek High School on December 30th was chaired by a representative of the National Police of Cambodia. Both events included student performances, remarks from sponsors and government representatives, road safety lessons, and trivia games. This is the second year of Chevron's collaboration on AIP Foundation Cambodia's helmet awareness activities, and its first year as a sponsor of Helmets for Youth. The events were preceded by training sessions for 100 teachers from both schools on December 18th and 19th. 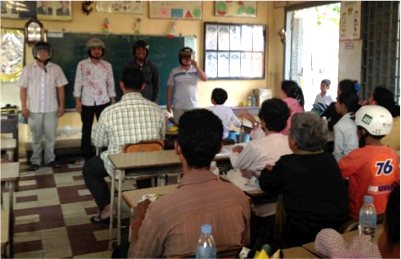 During these sessions, teachers were given information how helmets can prevent serious injuries and best practices for encouraging safe road behaviors in the classroom. At the conclusion of the training, teachers showed their commitment to wearing a helmet at all times when on a motorcycle and signed a public statement indicating their support for the draft traffic law. The traffic law will mandate helmet wearing for motorcycle passengers including children and is currently under review by the Council of Ministers. Read the press release and check out the photos. 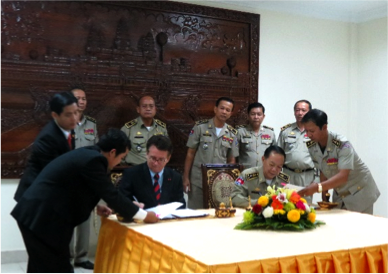 On December 30th, the National Police of Cambodia and AIP Foundation signed a Memorandum of Understanding (MoU) committing to work together to reduce road injuries and fatalities in Cambodia by 2016. AIP Foundation President and Founder Greig Craft travelled to Phnom Penh to sign the MoU, along with H.E Chan Kim Seng, Director of Central Department of Public Order, General Commissariat of National Police. The three-year agreement expands Cambodia Helmet Vaccine Initiative project activities to include a street-based awareness campaign, and advocates for passenger helmet use legislation along with increased traffic safety enforcement. AIP Foundation will donate reflective vests, traffic cones, speed guns, and breathalyzers to the National Police in order to support their efforts to increase road safety. The MoU also outlines shared goals including increasing the availability of high quality, affordable helmets, and raising awareness of the importance of passenger and child helmet use.